The state budget had several bills involved, but SB 96 is the one which includes the Cal/OSHA penalties. The impetus of this was Federal OSHA revamped several of their penalties, which had not been adjusted since the early 1990s. They applied an inflationary factor of 78%. 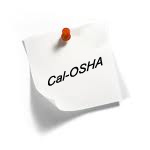 Since California is mandated to be at least as effective as Federal OSHA, some Cal/OSHA penalties had to be adjusted similarly. The California budget is effective 7-1-2017; but these adjustments won't be enforced until Cal/OSHA goes through a regulatory process. They are trying to fast track it, so the changes could be made very soon. We will let you know as soon as they are effective. Penalty amounts will now be adjusted annually for inflation. The penalties for serious violations will not change. California was already much higher than the Feds on serious violations. The maximum penalty for willful/serious violations increases from $70,000 to $124,709, per Labor Code Section 6429. The maximum penalty for posting, record keeping, or general violations goes from $7,000 to $12,471; per Labor Code Sections 6427 and 6431.